Finally, I’m back! Basically, I took a much longer holiday vacation than I had anticipated. December was a wild month and we started 2015 going at about a million miles an hour. 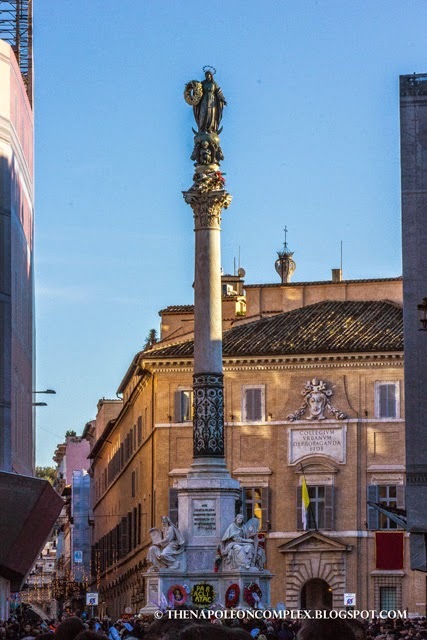 Since the last time I wrote, we visited another country, spent a week in the region of Emilia-Romagna, and spent this past week playing tour guide and touring Rome (for up-to-date pictures of our adventures, follow me on Instagram). The bad news is I’ve obviously neglected the blog a little bit, the good news is I’m back and I have so many things to write about I might not finish before spring! 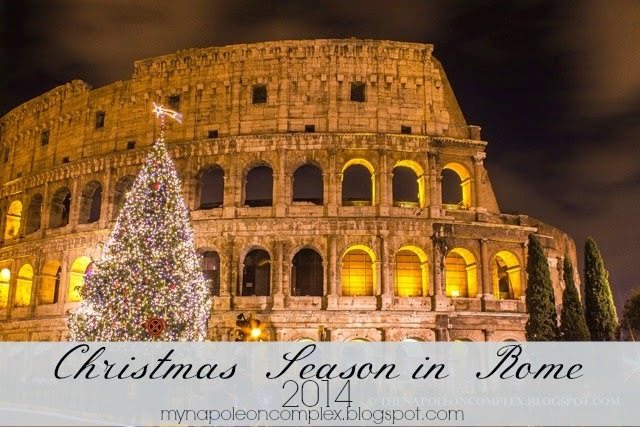 Today, I’m going to write about this year’s Christmas season in Rome. I’ve been reading posts from other bloggers showing off their city’s holiday decorations for the past month and although the holiday season is officially over, I can’t help but share some of our own pictures! 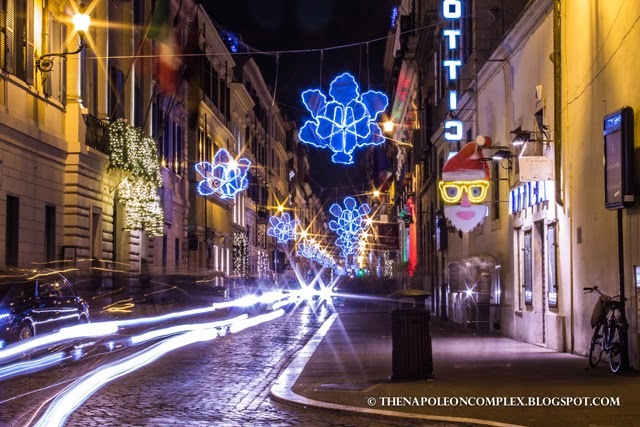 The Christmas season in Italy officially begins on December 8th with the Feast of the Immaculate Conception. On this day in Rome, the Pope visits the Virgin Mary statue in the Spanish Steps to lay a wreath of flowers and pray. 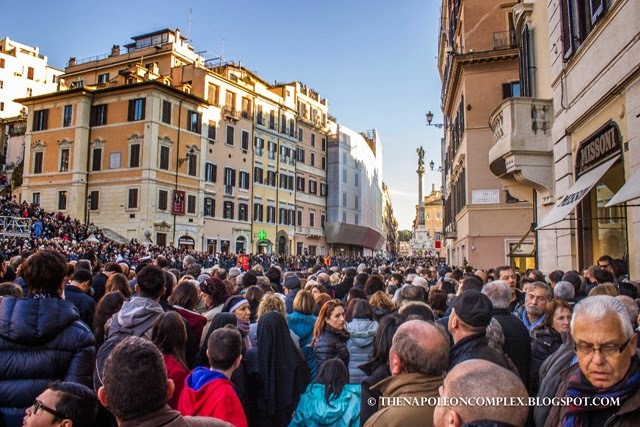 Last year, we missed this event so we attempted to see it this year, but when we arrived, there were so many people that we decided to not wait for the Pope. Even though we didn’t stay for the main event, we did get a picture. Christmas Eve and Christmas Day was a rather quiet affair for us. It was my first Christmas away from Miami, so it does make one a little homesick. Jaime and I made the best of it though because at least when you live in Rome, even if everything is closed on Christmas Day there is still plenty to see. 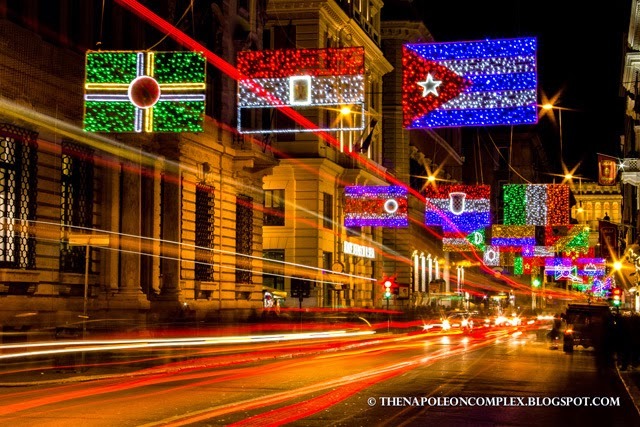 So we took the opportunity to walk around the center and take some pictures of all the lights around the city. Our Christmas tree! 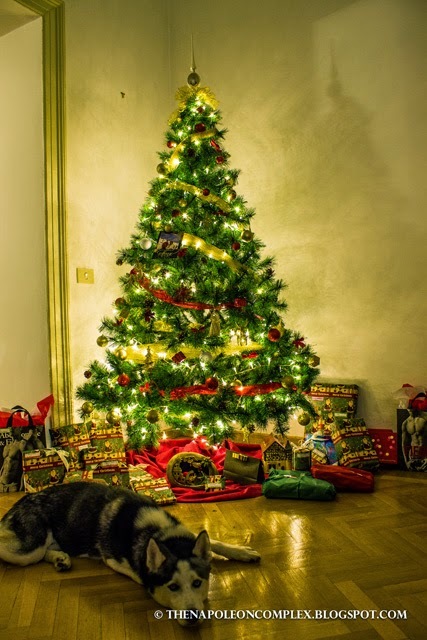 Obviously, when your dog willingly lays down in front of the Christmas tree, you need to take a picture. In my opinion, there seemed to be less streets illuminated this year and I wasn’t the only one who thought so. 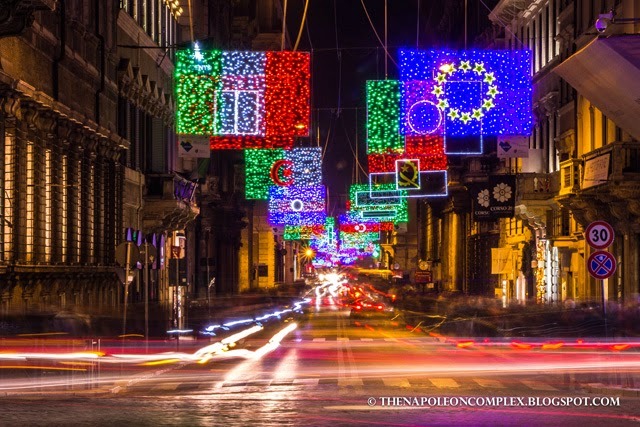 Still, the ones that were illuminated, primarily Via del Corso, really outdid themselves. 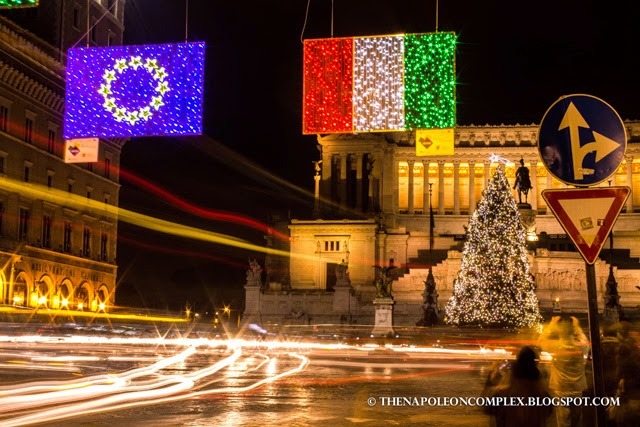 Italy and the EU flag up front. 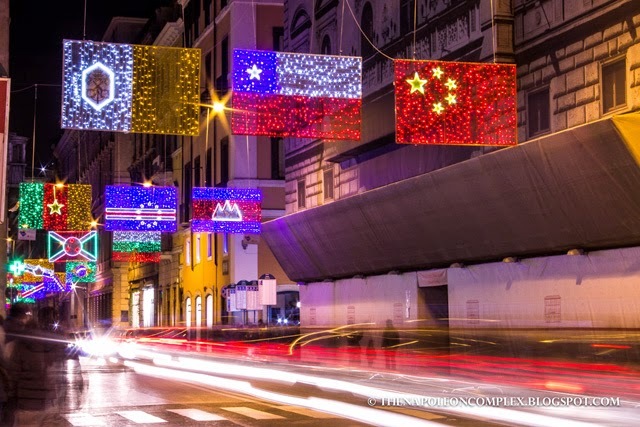 Via del Corso celebrated the upcoming Expo in Milan by putting up flags of every participating country, in alphabetical order by their Italian name. 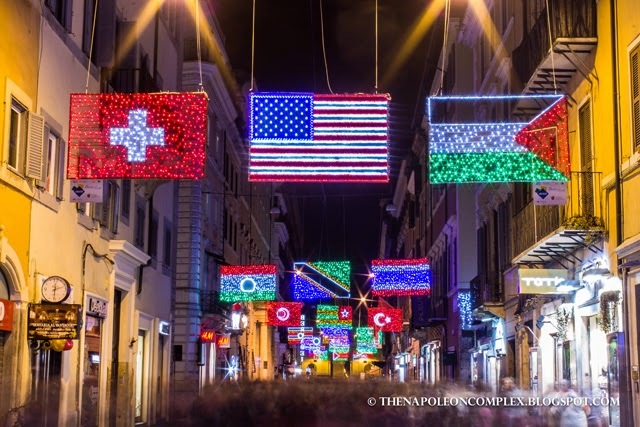 It was definitely my favorite of both this year and last (here you can see Via del Corso’s decorations from last year). 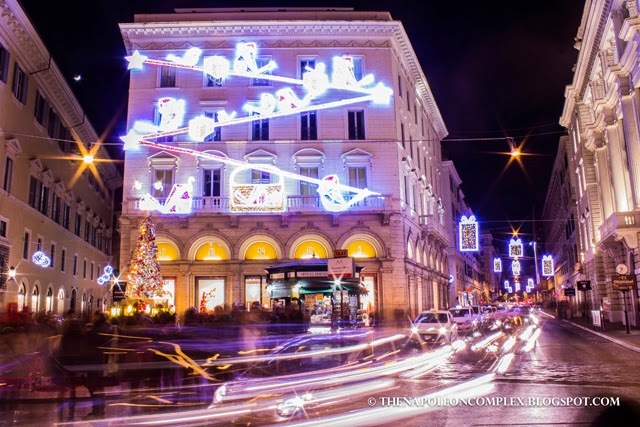 We took pictures at various points throughout Via del Corso. Here you can see the Vatican flag (front left). And of course we couldn’t not take a picture of Old Glory. Via Condotti’s lights were rather simple, but Fendi never fails to have their entire building lit up, much the same as it was last year. 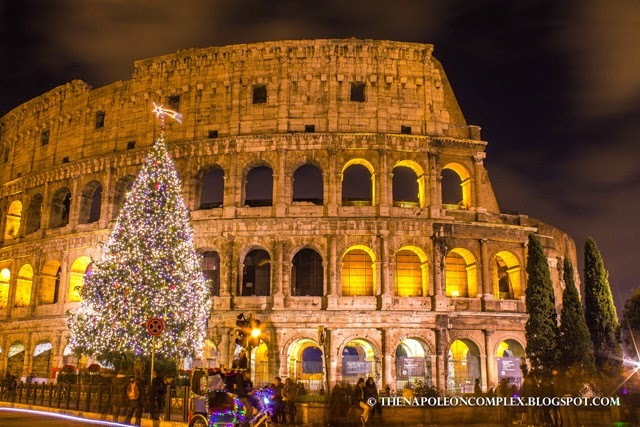 Finally, Piazza Venezia and the Monument to Vittorio Emanuele II as well as the Colosseum are two places that one shouldn’t miss during the holiday season. 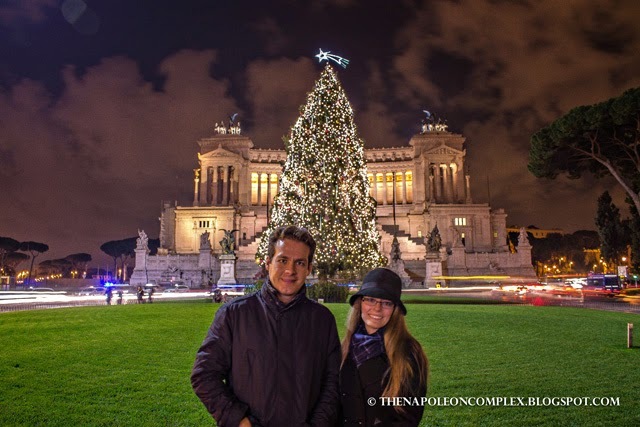 Both have huge Christmas trees and this year they closed the Via del Foro Romano that links the two places to motor traffic. There is an amazing view of the Colosseum as you walk toward it in the middle of the wide street. I wished we would have been able to go during the day, but we had no time after that night. 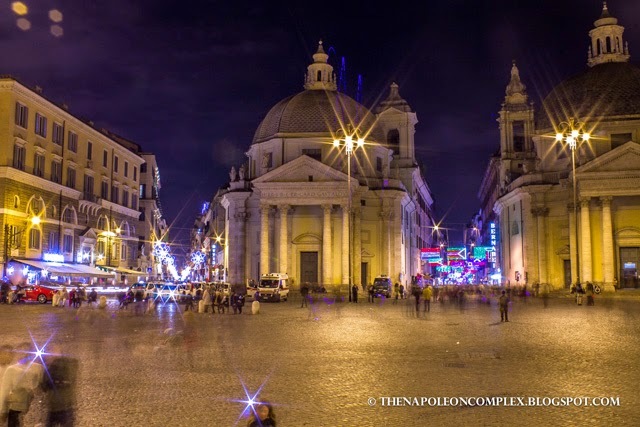 Piazza Navona’s Christmas market was pretty lame this year (lamer even than last year), as there were less than 10 stands open because of some disagreement between the city and the stand owners. I just realized as I was preparing the pictures for this post, but we didn’t take pictures of the Christmas tree in St. Peter’s Square, but they obviously had their tree and annual Nativity Scene set up as they always do. 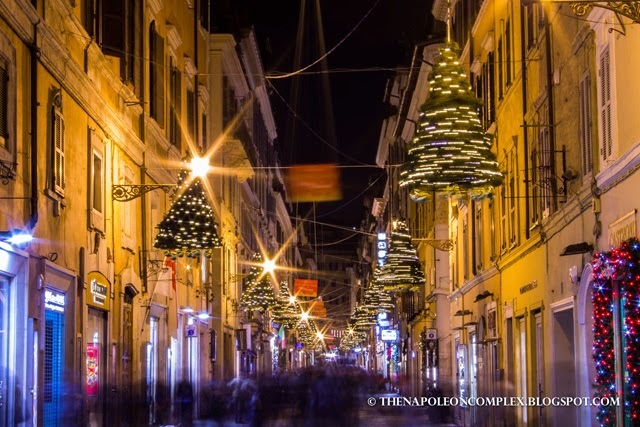 Loved this street (can’t remember the name) with the mini Christmas trees! All in all, I really can’t complain as spending Christmas in Rome (and most cities in Europe for that matter) is a unique experience that is truly unforgettable. I love all the flags, so pretty! 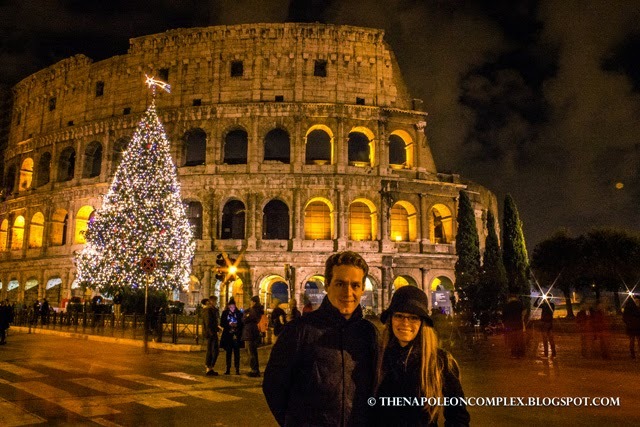 And wow, the Colosseum looks amazing during Christmas time! I know! And luckily the scaffolding has moved away from that iconic corner of the Colosseum so we got to take a really great picture! Thanks for reading, as always!